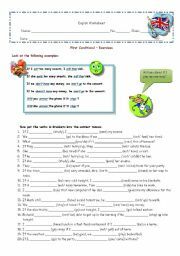 Look at the examples and put the verbs in brackets in the correct tenses. 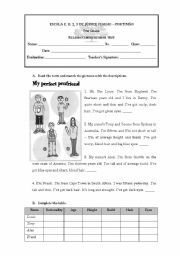 Completing sentences with the past simple; completing sentences with the conditional and then completing sentences with the correct form of the verbs. 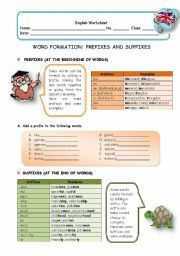 Grammar guide and exercises about word formation (prefixes and suffixes). 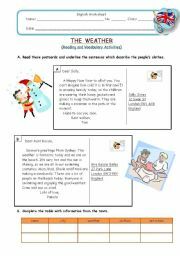 Two texts about the weather and comprehension activities. 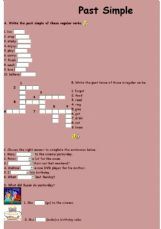 Vocabulary work. 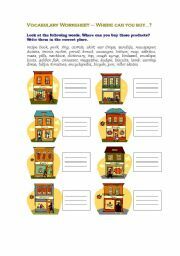 A vocabulary worksheet to revise shops and what you can buy at them. 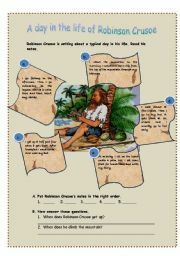 Reading a text and answering questions; matching countries and nationalties; writing short dialogues. Simple grammar-guide and exercises on past simple ( regular and irregular verbs) - affirmative, negative and interrogative forms. 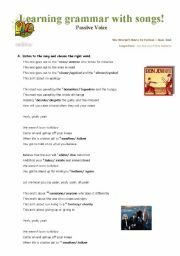 Introducing passive voice with the song We weren�t born to follow by Bon Jovi. Form, use and practice. Students have to identify some food and choose a favourite breakfast. 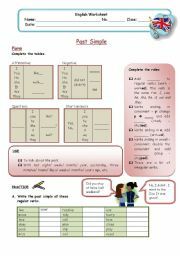 Exercises on the past simple. 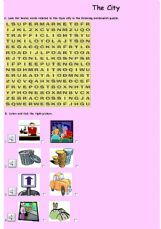 Vocabulary exercises on the topic city.